Raspberries, black currents, gooseberries, elderberries. 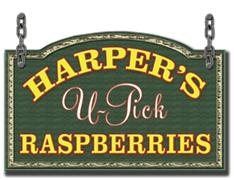 … You name it, we have a lot of different kinds of berries. Please read more about our selections under More Fruit. You will find our raspberry rows well mowed and the canes neatly trellised. The total row length available for picking in 2009 is 8 km. New planting will bring this up to 10 km in 2010. 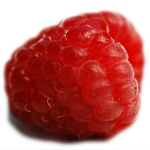 The earliest summer fruiting raspberry; medium sized with a very good flavour and easy picking. A mid season variety; fruit is bright red, with a flavour similar to that of the older varieties. A relatively new raspberry, fruiting about a week later than Killarney; large berries; thornless canes; the sweetest variety we have. This late variety with very large berries and a unique flavour is the most popular berry amongst our u-pickers; also one of the favourites of the wine makers. 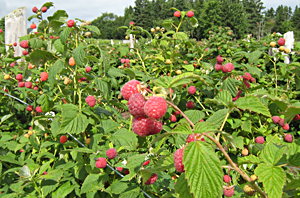 A cross between a raspberry and a blackberry; plants are a bit thorny; the fruit is large and easy to pick. It can be picked when the fruit is red or purple. It does not have a lot of eye appeal due to its dull colour. However, once tried, people keep coming back for it as it is superb for pies, jams and wine. 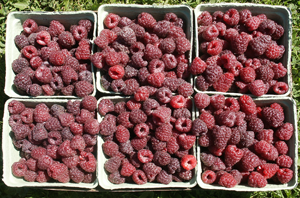 It is the last summer berry to ripen and we only have ½ acre of this variety.